I had two presentations at last Saturday’s USACAS-9 conference at Hawken School in Cleveland, OH. Following are outline descriptions of the two sessions with links to the PowerPoint, pdf, and .tns files I used. I’m also adding all of this information to the Conference Presentations tab of this ‘blog. This session started with a brief introduction to a lab that first caught my eye at the first USACAS conference years ago. You know how the graph of behaves when you vary a and c, but what happens when you change b? I ‘blogged on this problem here and here. In the session, we used TI-Nspire file QuadExplore. Next, we explored briefly the same review of trigonometric and polar graphs not as static parent functions under static transformations, but as dynamic curves oscillating between their ceilings and floors. In the session, we used TI-Nspire file Intro Polar. Having a complete grasp of polar graphs of limacons, cardioids, rose curves, and hybrids of these, I investigated what would happen for curves of the family . 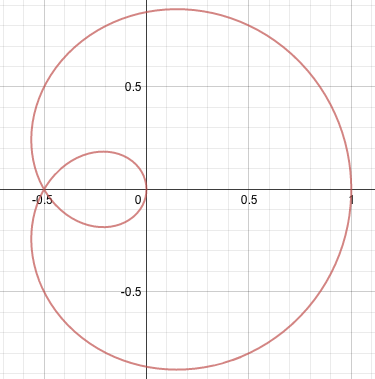 Curiously, for , I encountered a curve that looked like a horizontal translation of limacons–something that just shouldn’t happen within polar coordinates. One of my former students, Sara, used a CAS to convert a polar curve to Cartesian, translate the curve, and convert back to polar. She then identified and solved a trig identity to confirm what the graph suggested. A complete description of Sara’s proof is below. I originally ‘blogged on Sara’s work here which was a much more elegant solution to the problem than my initial attempt. It’s always cool when a student’s work is better than her teacher’s! I used TI-Nspire file Polar Fractions in Saturday’s session. The last example presented itself when I created a document to model the family of conic curves resulting from manipulating the coefficients of . 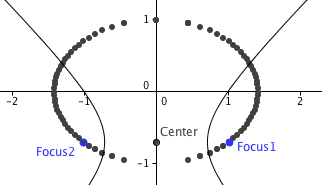 After I created dynamic points for the foci of the conics, something unusual happened when the E parameter for horizontal ellipses and hyperbolas varied. 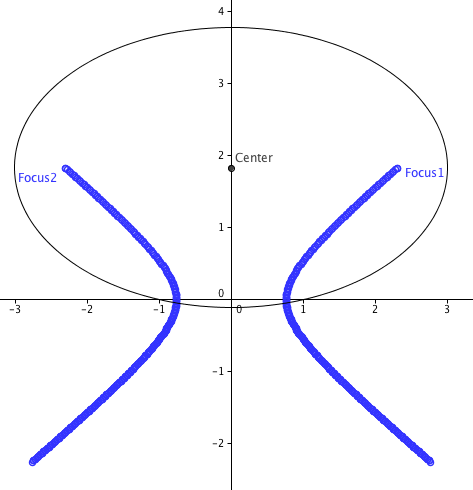 The foci for hyperbolas followed an ellipse, and the locus of elliptical foci appeared to be a hyperbola. Another former student, Lilly, proved this property to be true. A detailed explanation of Lilly’s proof is below. We were fortunate to have Lilly’s work published in the Mathematics Teacher in May, 2014. To demonstrate this final part of the session, I used TI-Nspire file Hidden Conic Behavior. Here is my PowerPoint file for Powerful Student Proofs. A more detailed sketch of the session and the student proofs is below. The basic proposal was that adding the Reciprocal transformation to the palette of constant dilations and translations dramatically simplified understanding of the behavior of rational functions around even and odd vertical asymptotes (bouncing off and passing through infinity). Just like lead coefficients of polynomials determine their end behavior, so, too, do the lead coefficients of proper rational expressions define the end behavior of rational functions. Extending the idea of reciprocating and transforming functions, you can quickly explain exponential decay from exponential growth, derive the graphs of and , and completely explain why logistic functions behave the way they do. We finished with a quick exploration of trigonometric and polar graphs not as static parent functions under static transformations, but as dynamic curves oscillating between their ceilings and floors. I used TI-Nspire Bending and Intro Polar files in the demonstration. Here is my outline PowerPoint file for Bending Asymptotes. 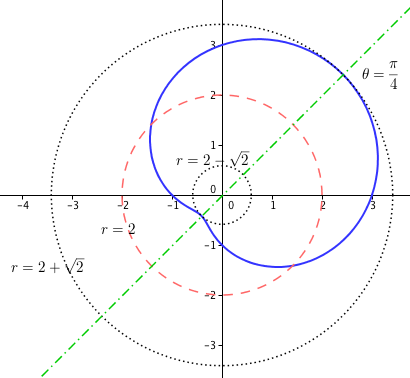 Nurfatimah Merchant and I were playing around with polar graphs, trying to find something that would stretch students beyond simple circles and types of limacons while still being within the conceptual reach of those who had just been introduced to polar coordinates roughly two weeks earlier. We remembered that Cartesian graphs of trigonometric functions are much more “interesting” with different center lines. That is, the graph of is nothing more than a standard cosine graph oscillating around . 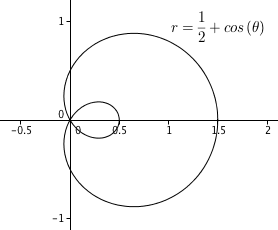 Likewise, the graph of is a standard cosine graph oscillating around . We teach polar graphing the same way. 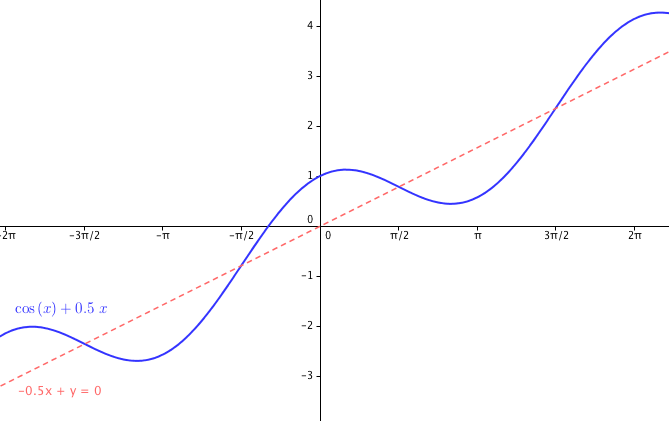 To graph , we encourage our students to “read” the function as a cosine curve of period oscillating around the polar function . 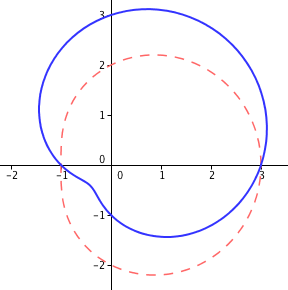 Because of its period, this curve will complete a cycle in . The graph begins this interval at (the positive x-axis) with a cosine graph 1 unit “above” , moving to 1 unit “below” the “center line” at , and returning to 1 unit above the center line at . This process repeats for . Our students graph polar curves far more confidently since we began using this approach (and a couple extensions on it) than those we taught earlier in our careers. It has become a matter of understanding what functions do and how they interact with each other and almost nothing to do with memorizing particular curve types. So, now that our students are confidently able to graph polar curves like , we wondered how we could challenge them a bit more. Remembering variable center lines like the Cartesian , we wondered what a polar curve with a variable center line would look like. Not knowing where to start, I proposed , thinking I could graph a period sine curve around the limacon . There’s a lot going on here, but in its most simplified version, we thought we would get a curve on the center line at , 1 unit above at , on at , 1 unit below at , and returning to its starting point at . We had a very rough “by hand” sketch, and were quite surprised by the image we got when we turned to our grapher for confirmation. The oscillation behavior we predicted was certainly there, but there was more! What do you see in the graph of below? This looked to us like some version of a cardioid. Given the symmetry of the axis intercepts, we suspected it was rotated from the x-axis. 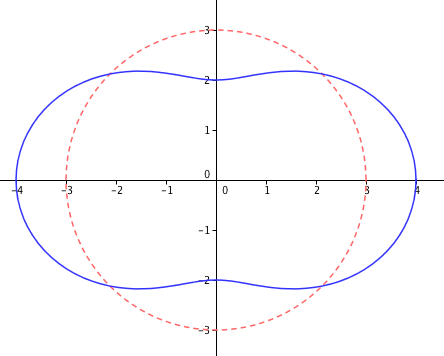 An initially x-axis symmetric polar curve rotated would contain the term which expands using a trig identity. Eureka! This identity let us rewrite the original polar equation. 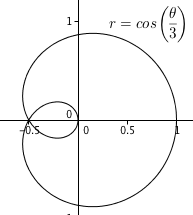 And this last form says our original polar function is equivalent to , or a rotated cosine curve of amplitude and period oscillating around center line . This last image shows a cosine curve starting at beginning above the center circle , crossing the center circle later at , dropping to below the center circle at , back to the center circle at before finally returning to the starting point at . 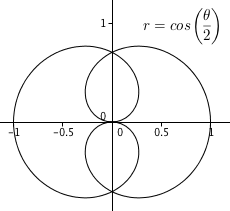 Because the radius is always positive, this also convinced us that this curve is actually a rotated limacon without a loop and not the cardioid that drove our initial investigation. So, we thought we were departing into some new territory and found ourselves looking back at earlier work from a different angle. What a nice surprise! One more added observation: We got a little lucky in guessing the angle of rotation, but even if it wasn’t known, it is always possible to compute an angle of rotation (or translation in Cartesian) for a sum of two sinusoids with identical periods. This particular topic is covered in some texts, including Precalculus Transformed.